Nothing could embody the proverb, "it's not about the destination, it's about the journey," than our just completed, Sacred Journey to Peru. Everything about the trip was spectacular - the sights, the energy, the food, the environment, etc. - but what forever etched the trip into my mind were the experiences I shared along the way with the 17 explorers that comprised our group. 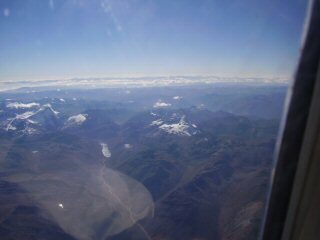 The magic began with our flight from Lima to Cusco. Just after we crested the Andes, I felt my crown chakra open up and lock into a group of "well wishers." This is different than the sensation you feel in your third eye when you sense someone on earth is trying to contact you. I mentioned it to my seatmate, Leslie, who asked me how I could tell. I told her to place her hand 12 inches above my head. She shook her head in amazement at the heat; the energy was that strong. I knew this journey would be special. Upon landing in Cusco, many of us were overwhelmed with feelings of joy, as evidenced by spontaneous outpourings of tears. Clearly, this was a homecoming. These feelings were even more pronounced at some of the sacred sites, especially the ones with formal, stone entrances. Psychometry is the art of perceiving subtle energies in material objects by touching them. Stone entrances where thousands had passed over the centuries provided sensations that were stronger and much more tangible than holding a watch, for example. By placing our hands on these stones, many of us could perceive familiar sensations that welcomed us home. In Cusco, due to a "miscommunication," a group of us had dinner together. As it turned out, there was no "miscommunication," as everything was in divine order. Had Jeannine listened more carefully, she would have joined a different group and missed contributing to our conversation. When I looked at Jeannine, I recognized her and said, "you were there, too, but you were a man back then." She nodded in acknowledgement and filled in more details, including the name of the city in which this occurred. Christine was also moved, as she remembered being rescued during the evacuation. Clearly, had Jeannine focused on the "destination," she would have missed the "journey" that included this recollection which gave us all goosebumps. In many religious texts you read stories about "going up a mountain," or "going into the desert" to commune with God and gain inspiration. What the individual is doing is getting away from the "noise" of everyday life so that he or she can more easily use his or her inner senses to perceive the subtle vibrations of the inner worlds. Without the mental noise and the energetic congestion of radio, TV and cell phone transmissions, the sacred sites in Peru provided an ideal environment in which to meditate. I looked for an opportunity to do so atop Machu Picchu during some free time and was joined by Christine, Kirsten and Leslie. Late in the day, the top of Machu Picchu was packed with tourists, photographers and guides speaking a variety of languages. I sat on a rock and attempted to meditate despite the distractions. I cleaned my psychic centers and raised my vibration to better attune with God, but kept getting the message, "wait." Focused on my preparation, I didn't pay attention to what was happening around me. Without a word, my three companions had taken positions at the north, west and south of the terrace while dozens of onlookers simply vanished! In the silence atop the mountain, we had a beautiful meditation. As soon as we were done, the crowds returned. While goals are critical to determining where you want to go, it's important to pay attention to the journey. From the mystic perspective, we are all destined to return to God, the Oneness. Were we only to consider the destination, there would be no time and space. There would be no experience of separation. And there would be no joy as you made a connection that brought you closer to God. Our Sacred Journey to Peru was an opportunity to experience those little joys that better help us to connect with God. But you need not wait for a special trip to do this. Just contemplating the beauty of a flower or observing a child's joy at experiencing the ocean for the first time is part of the journey that you can savor forever, if you simply remember to do so. For more pictures of Peru, please visit: Peru Travelogue.